As we reported some of the survey results below, almost nine in ten members say that the industry must clean up the tote system. It seems late odds changes are beginning to wear on the fan base. Friday's race 5 at Hollywood Park seems to illustrate this well. The eventual winner, Spirit of Cochise was 6-1 for almost all of the betting - until the very end. 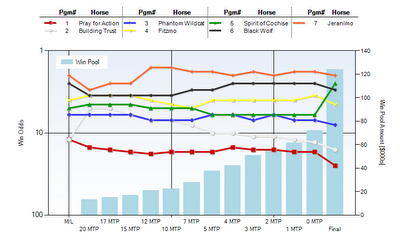 That is (the green line is the money on Spirit of Cochise) a boatload of cash folks. 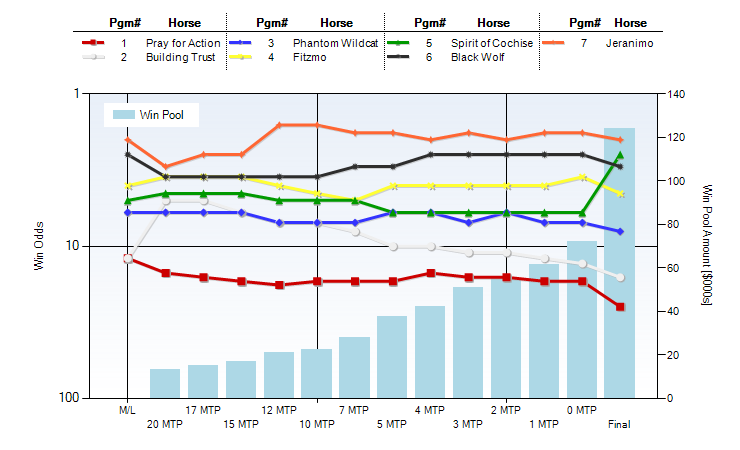 All other horses lines move down, and Spirit's is like an Intel stock chart when announcing they beat earnings estimates by a football field. What track execs do not seem to understand about this, is that we as horseplayers bet horses based on our perceived value. At 6-1 a horse is a green light or red light bet based on our thoughts about a 14% or so hit rate. The other horses are handicapped the same way. When a 14% chance horse is transformed into a 28% chance horse in one flash, it causes us serious difficulties as horseplayers. The tote system in racing needs an overhaul. It is failing racings customers. Yes, what's needed is a Betfair-type peer-to-peer platform. We can document these late-money "anomolies" until we're blue in the face. We can complain until our email-composing fingers fall off and our voices give out. Nothing changes. And, nothing will change until enough of us just walk away from the game until they fix it. The industry has no motivation to fix anything as long as the revenue keeps rolling in. Am I the only one that understands that?